I'm Excited, But You May Not Be ~ The Bucky Channel - The World of Sports from Wisconsin's Perspective. 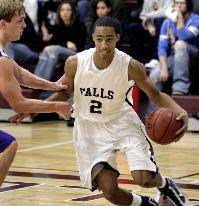 J.P. Tokoto may playing basketball for Menomonee Falls right now, but he will be heading to UNC when he is done with high school. On Thursday night, the stud junior picked North Carolina over Wisconsin, the reason being because of the style of basketball they play. I bet this has to be one of the toughest decisions for a young person to make. I'm sure he wants to be closer to home so that his family can watch him in college. On the other hand though he does have to look out for himself, and if he thinks he will fit in better at UNC, then I say why not go there? Either way he was going to end up at a good program, and this experience should be an exciting time for him. Tokoto is rated in the top 50 for the 2012 class, and is ranked the 7th small forward on scout.com. Personally, I'm a pretty big UNC fan so it will be cool to see a guy play that is from Wisconsin. Can't say I get to see that very much. I wasn't around when Kohler's Joe Wolf went to UNC, but from what I see that choice seemed to work out for him. You may see him on the sidelines of the Bucks, coaching under Scott Skiles (or you may not, depending on how little you're watching the Bucks this year). So good for Tokoto, but I'm sure everyone wishes he would have gone to Wisconsin. But would he have even fit in there is the big question. He is 6-foot-7 and has a 40 inch vertical jump. He has the body to be a star, so I hope he works hard. It is always nice to see someone work hard and come out of Wisconsin to play in the pros. Going to UNC will get you a lot of national coverage, but you still need to perform on the court to make it big. Congrats again to J.P. Tokoto for his accomplishment.